Iowa’s tight budget has raised much discussion about what fiscal policies the Legislature should consider to alleviate this situation. Debate has included reviewing Iowa’s numerous tax credits, re-evaluating the property tax backfill obligations, and considering general spending and tax reform. Some have even seemingly ignored the tight budget to argue for more spending and claim that programs such as education and health and human services need to be more “fully funded.” Ultimately what Iowa needs is a pro-growth fiscal policy that will both further grow the economy and create additional opportunities for all Iowans. The Tax Foundation recently released their 2018 State Business Tax Climate Index and once again Iowa is ranked 40th out of the 50 states in terms of our tax climate. Iowa’s low ranking is attributed to our high tax structure considering the income, corporate, sales, and property taxes, among other costs that impact business and economic growth. Iowa’s overall economy is in relatively good shape with unemployment at 3.2 percent, but the agricultural economy continues to face pressure, which is a major contributing factor to the lower than expected revenues. Both Laffer and Moore have studied the economic impact of states that have lower tax rates and levels of regulation versus states that have high tax rates and high levels of regulation. “We have 10 and 20 and 30 years of statistical evidence that low tax and lighter regulation states have been growing a lot faster than those that try to tax and regulate their way to prosperity,” wrote Laffer and Moore. North Carolina is another example of a state that lowered both taxes and spending. In fact, North Carolina was confronted with a $3 billion budget gap and in response, the Legislature decided to resolve the budget crisis not with tax increases, but by reducing spending and lowering taxes. North Carolina also provided an economics lesson that other states, and especially the federal government, need to follow. The tax cuts initiated by the North Carolina Legislature were prudent, that is, they made sure to keep spending under control to avoid deficits. This is an important lesson for all policymakers to learn. This will be a challenge for the Iowa Legislature as they consider tax relief in the next legislative session. 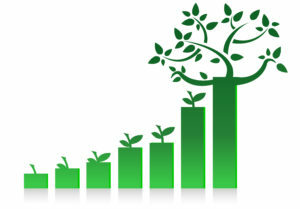 The recent October Revenue Estimating Conference projected further tight revenues. Although Iowa’s revenues are not declining, the lower than expected revenue growth creates a problem for legislators. Liberal politicians and progressive voices in Iowa are arguing that state government cannot afford any additional “austerity” style cuts to government and policymakers must address the over-generous tax credits to large corporations. From the opposite side, conservatives are arguing that tax reform is a priority and the Legislature must address spending. 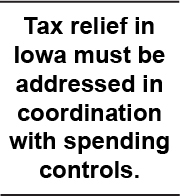 Just as with North Carolina, any tax relief in Iowa must be addressed in coordination with spending controls to avoid deficits. Iowa, which has both high individual income taxes and the highest state corporate tax rate, must start the process of working toward lowering tax rates across-the-board. Advancing towards lower rates will mean that the Legislature will have to consider more prudent spending and evaluate the entire menu of current tax credits. This is what is occurring in Indiana. “As Indiana lowered rates, we have also reduced or eliminated many tax incentives, allowing our flat rates to be our strongest selling point,” stated Senator Hershman. If Iowa can achieve lower tax rates over time, the need for so many tax incentives will be reduced. States will likely never be able to get away from all forms of tax incentives, though; even states with low tax rates will still compete to win deals. But those lower rates that will make Iowa more competitive will mean the government can stop picking winners and losers so often. This is a formula that Iowa policymakers can follow.